Srinagar, September 11 (KMS): In occupied Kashmir, Indian troops in their fresh act of state terrorism martyred two youth during a cordon and search operation in Kupwara and one PhD scholar, in disguise, in Srinagar. The troops killed 18-year-old Furqan and Liaqat Ahmed at Guloora in Handwara area of Kupwara district, today. A 42-year-old PhD scholar, Abdul Ahad Ganai, was shot dead by Indian army men in disguise in Khanyar area of Srinagar. The attackers were wearing civilian clothes. Abdul Ahad Ganai, a resident of Lolab, Kupwara, was pursing PhD from Aligarh Muslim University. Sadly, Liaqat was martyred on a day when his sister was getting married, today. The killings triggered clashes between protesters and troops in Handwara and Sopore areas. The authorities suspended Internet services and shut educational institutions. 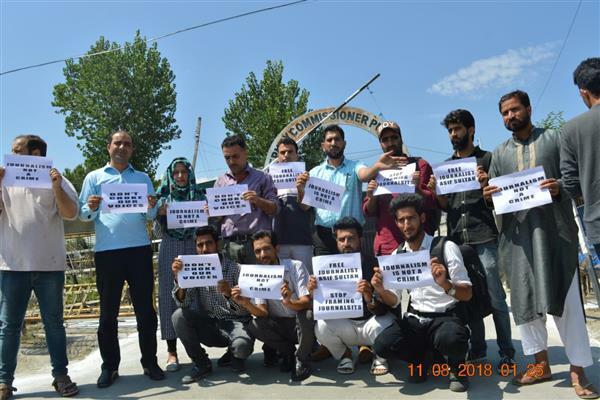 Srinagar, September 11 (KMS): In occupied Kashmir, journalists associated with Working Journalist Association (PWJA) Tuesday staged a protest outside the office of Deputy Commissioner, Pulwama, against the detention of their colleague, Asif Sultan, by the Indian authorities. Brussels, September 11 (KMS): The Chairman Kashmir Council Europe (KCEU), Ali Raza Syed has hailed the statement of new United Nation High Commissioner for Human Rights, Michelle Bachelet, on the rights violations in occupied Kashmir. Srinagar, September 11 (KMS): In occupied Kashmir, sister of one of the two youth, martyred by the Indian troops during a cordon and search operation in Handwara area of Kupwara district was getting married, today. Srinagar, September 11 (KMS): In occupied Kashmir, Hurriyat leaders and organizations continued to pay tributes to martyred activist of Tehreek-e-Hurriyat, Hakeem-ur-Rehman Sultani, who was killed by men of Indian agencies in Bomai Sopore on Saturday. Srinagar, September 11 (KMS): In occupied Kashmir, journalist fraternity remembered noted photojournalist, Mushtaq Ali, on his 23rd death anniversary. Mushtaq Ali was killed in a parcel bomb explosion at Press Colony in Srinagar on September 10, 1995. Congregational Fateha Khawani was organized by ‘Shaheed Mushtaq Ali Memorial Committee’ at the Martyrs’ Graveyard, Eidgah, in Srinagar to mark the anniversary of Mushtaq Ali. People from different walks of life including Hurriyat leaders and activists, journalists, and civil society members were present on the occasion. Meanwhile, journalist community also remembered photojournalist, Shafat Siddique, who drowned in floods in 2014 while performing his professional duties. Srinagar, September 11 (KMS): In occupied Kashmir, the Human Rights Commission has directed Director General (DG) Prisons to file a report on the arrest of Hurriyat activist, Umar Aadil Dar, under draconian law, Public Safety Act. A Commission member, Dilshada Shaheen, taking note of an application submitted by the rights activist, Muhammad Ahsan Untoo, about the slapping of PSA on Umar Aadil Dar issued a notice to the DG prisons asking him to file a detailed compliance report before the rights body by September 25. The commission asked DG to file report of compliance that includes grounds of detention under which Umar Aadil Dar was arrested and lodged at Kathua jail in Jammu. New Delhi, September 11 (KMS): A Delhi court sent the second son of prominent Kashmiri freedom leader, Syed Salahuddin, to judicial custody in a fake case, registered against him by India’s National Investigation Agency in April 2011. District Judge, Poonam A Bamba, sent 48-year-old Syed Shakeel to the judicial remand after he was produced before the court on expiry of his NIA custody. Syed Shakeel was arrested on August 30 by the NIA accompanied by Indian police and CRPF during a raid at his Rambagh residence in Srinagar. He works as Lab Technician at Soura hospital. He was then taken to New Delhi and produced before the court. London, September 11 (KMS): An All-Party Conference of all political, social and religious organisations of the Kashmiri diaspora was held at Birmingham. Srinagar, September 11 (KMS): In occupied Kashmir, the Chairman of Hurriyat forum, Mirwaiz Umar Farooq has welcomed the statement of new UN rights chief, Michelle Bachelet in which she slammed India for lack of any meaningful improvement on addressing issues highlighted in the UN report on human rights violations in the territory.